Rabbi Kolesnik speaking before offering his prayer. Photo © 2018 Jay Osborn. Jay and I were in Rohatyn with friends yesterday to mark the 75th anniversary of the final Nazi aktion which liquidated the wartime Jewish ghetto. 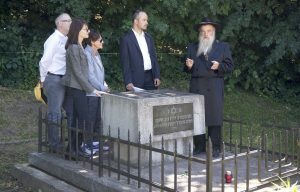 Once at the “vodokanal” north mass grave site, gathered around the memorial marker erected in 1998 by Jewish survivors and descendants of Rohatyn, our long-time friend and supporter Rabbi Kolesnik of Ivano-Frankivsk recited a prayer and concluded with the El Malei Rachamim (אֵל מָלֵא רַחֲמִים, “God, full of mercy”) for the souls of the departed and martyred. A dozen friends and supporters from Lviv and elsewhere solemnly listened and stood witness. 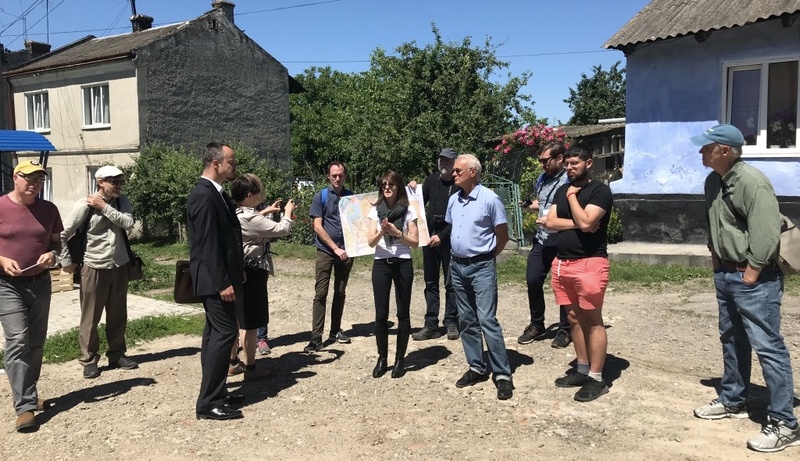 We were joined by Rohatyn Jewish descendants from Israel and Canada, Morey Altman and his aunt Helen Altman Hochberg, who were accompanied by Lviv professional guide Alex Denysenko, a supporter of Rohatyn Jewish Heritage for many years. Helen’s father (Morey’s grandfather) was born in Rohatyn, and her mother (Morey’s grandmother) was born in nearby Burshtyn. An image from the 2017 memorial. 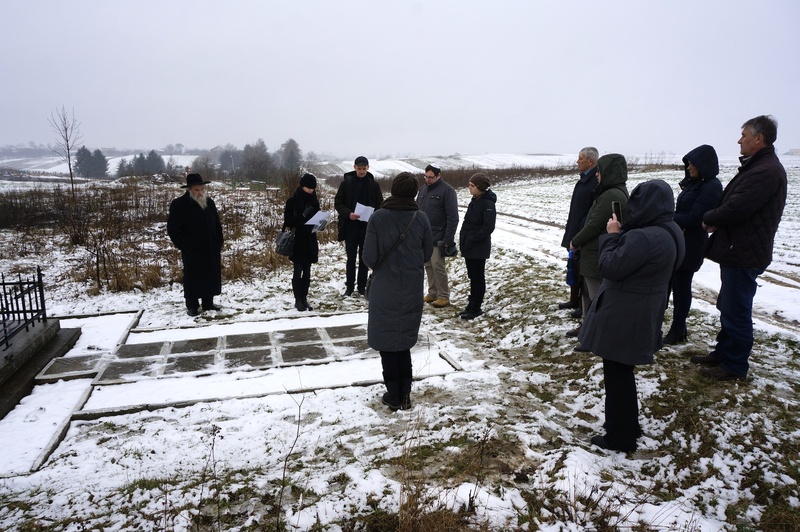 Last year on March 20, 2017 we came to Rohatyn to stand witness and honor the memory of the more than 3,000 Jewish men, women, and children who were executed 75 years ago and buried together at a wind-swept site south of the town center. This violent event represented the first of several official “aktions” perpetrated in Rohatyn under the Nazi occupation, their goal being to destroy Rohatyn’s 350 year old Jewish community. Between March 1942 and June 1943, the Jewish ghetto of Rohatyn was attacked repeatedly: two deportations to Bełżec extermination camp, one on Yom Kippur in September 1942 and another deportation two months later in December; plus, unknown numbers of sporadic, unofficial, and spontaneous executions of individuals and groups within the ghetto itself and at Jewish hiding places around town and in the nearby villages. Marla speaking to the group. Photo © 2018 Jay Osborn. Today we are back in Rohatyn, at another site north of town center commonly known as the vodokanal. We are here to remember that 75 years ago today, the final liquidation of the Rohatyn Jewish ghetto began: a series of organized executions and burials at this site starting on June 6 1943 and continuing for 2 to 3 days, taking the lives of several thousand Jews from the district. 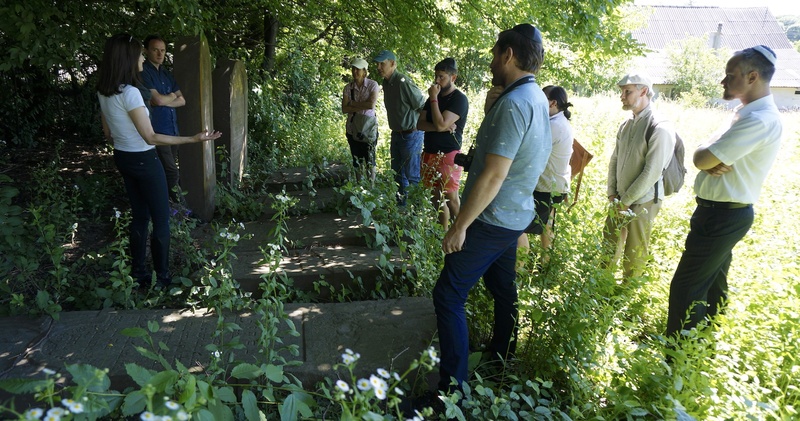 Jewish and Ukrainian memoirs say that smaller executions continued here afterward, killing captured survivors from earlier aktions, until the end of the war. When the ghetto was liquidated 75 years ago, most of the Jewish individuals and families originally from Rohatyn – our families – had already been murdered. Those still alive in the reduced ghetto space were mostly Jews forcibly brought to Rohatyn from surrounding towns and villages. They numbered more than 3000. Some of these Jews anticipated the fate that awaited them, and went into hiding in bunkers clandestinely built inside and outside the ghetto. Most did not succeed in eluding capture and were shot upon discovery. A small, unknown number resisted the liquidation with fortifications and weapons smuggled into the ghetto, too few to withstand the onslaught during those days. 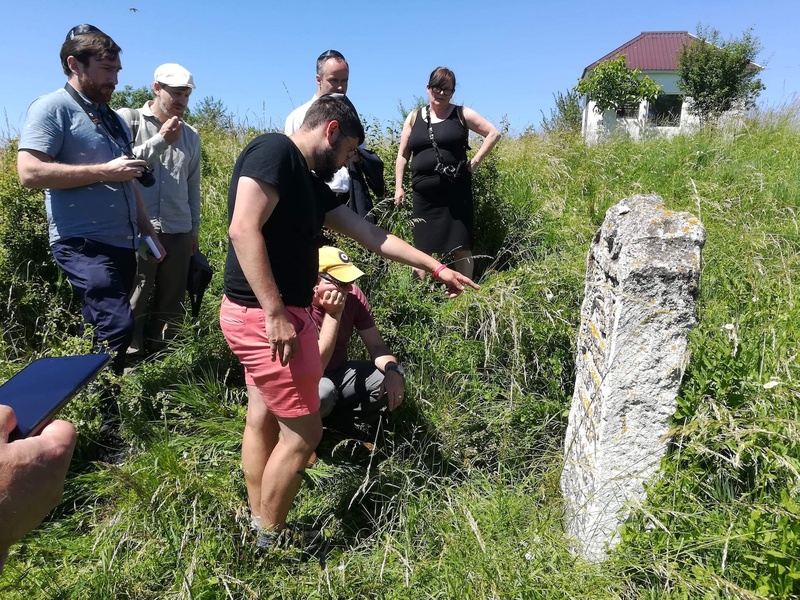 We know from Jewish and Ukrainian testimonies that ghetto inhabitants were marched to the vodokanal – the area where we stand today – and shot on planks laid over over deep trenches, dug days before; there were only a few witnesses. Remembering the dead at the north site. Photo © 2018 Jay Osborn. It is painful 75 years later to imagine the violence of those days. It is not difficult to understand that for many Rohatyn Jewish descendants it is still too painful to come today to Rohatyn. We are immensely grateful that Rohatyn Jewish survivors and descendants came to Rohatyn twenty years ago to erect this monument as a memorial to the lost, together with the City Administration of Rohatyn, local historians and townspeople, and religious leaders of all faiths, including Rabbi Kolesnik here with us today. By your coming together today to pray, to reflect, and to honor the memory of the Jewish victims, you build bridges and soothe cross-generational pain. By our presence here together, by our solidarity on this date, at this site, we send a message of tolerance and forgiveness, of remembrance and compassion. On behalf of my Rohatyn families and Rohatyn Jewish descendants living abroad, I thank you for coming and joining me in remembering our common history. May the memory of the victims bind us together. We were very sorry that our dear friend and local supporter Mykhailo Vorobets was unable to attend yesterday’s memorial. We heard from mutual friends that Mr. Vorobets was needed to care for one of his children, who was recently hospitalized. He was greatly missed, and we wish his child a speedy recovery. We wish to thank Rabbi Kolesnik, who continues to be a friend, supporter, and advisor to Rohatyn Jewish Heritage, for grounding this ceremony in Jewish traditions. With some of group gathering before the ceremony, in town and at the vodokanal site. Photos © 2018 Jay Osborn. In Rohatyn’s old Jewish quarter. Photo © 2018 Rachel Stevens. We also want to thank all of our friends who joined us in Rohatyn to attend the ceremony. A big thank you to our “Lviv faculty” which included professors Rachel Stevens and Jack Wright, Ian Bateson, and Aaron Kennet (all of whom are in Ukraine on Fulbright projects), plus Sonia Engström, lecturer at Lviv National University in Swedish language and blogger on the viewpoint-east.org web journal, and her partner Gustav Söderström; former Peace Corps volunteer in Ukraine Ryan Michael Knight, here in continuing education as part of his US studies in conflict resolution; and Viktor Susak, professor of sociology and history in Lviv (and author of several papers we use in our history research). In the old Jewish cemetery. Photo © 2018 Casey Alexa Peel. We are especially grateful to Wito Nadaszkiewicz, attorney for our NGO, who interpreted at the day’s event, and who remains a strong supporter of our projects and a good friend. It was a great pleasure to also see again former Rohatyn Peace Corps volunteer Casey Alexa Peel, who was in town yesterday and able to join us. This was also our chance to finally meet Ivan Yurchenko, who leads projects documenting and indexing Jewish heritage in Halych and Burshtyn, not far from Rohatyn. And we wish to thank our drivers for the day, Vasyl Yuzyshyn and Sasha Tomashuk, for their care and assistance with transport and many other practical concerns; Vasyl has been a friend and an essential supporter of Rohatyn Jewish Heritage for over a year, and we were pleased to welcome Sasha on a first visit to our project. Thank you all for coming. The group at the south mass grave memorial monument. Photo © 2018 Jay Osborn. The 1943 final aktion at the north mass grave at the vodokanal began on June 6 and lasted at least two days. It is likely that several pits were dug and used for executions during the war at this site, beyond the June 1943 events. New information about the mass graves at the site came to light at the beginning of this year, some months after the completion of the professional survey which Rohatyn Jewish Heritage funded last summer. Protecting this site (as well as the mass grave south of town center) is on our agenda for future conversations with the city of Rohatyn. At Rohatyn’s new Jewish cemetery. 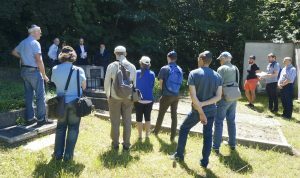 Last year, Rabbi Kolesnik also led a memorial prayer at the south mass grave, marking the 75th anniversary of the first major aktion in Rohatyn on March 20, 1942. 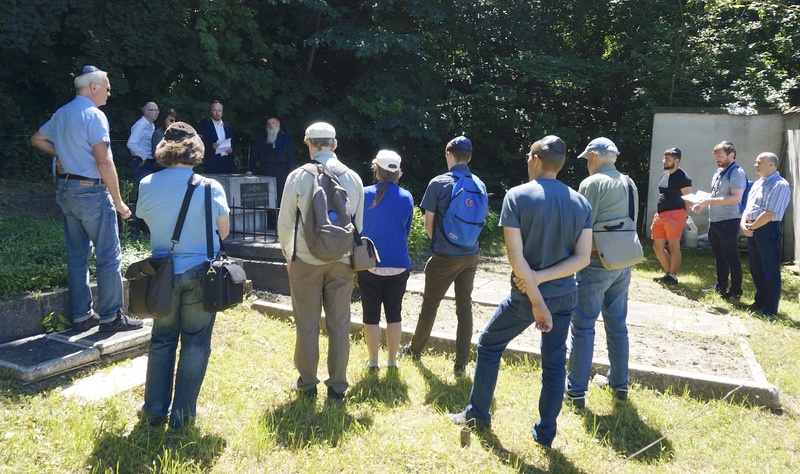 Following the ceremony yesterday, we led the group on a tour of some of the historic Jewish sites in Rohatyn, including the market square, the old “Jewish quarter”, the south mass grave, and both the old and new Jewish cemeteries. We have been meeting and discussing with all of these people about our projects, some for several years, so this was a great opportunity for us to visit the sites with them, discuss the history, and see the issues first-hand. We value their questions, input, and advice, and look forward to continuing relationships with each of them on these and many other topics.